Order your own copies of these Game Mats at your local retailer or online through our website today! As the Galactic Civil War spreads to engulf the entire Star Wars galaxy, battles can break out on any planet. Whether Imperial troops are striking at a hidden Rebel outpost in an epic engagement, or Rebel forces are hitting a sensitive Imperial target in a minor skirmish, each new operation can play out on widely different terrain. Now, your Star Wars: Legion battles can transport you and your troops to some of the saga’s most iconic planets. Fantasy Flight Games is happy to announce three new playmats for Star Wars: Legion! 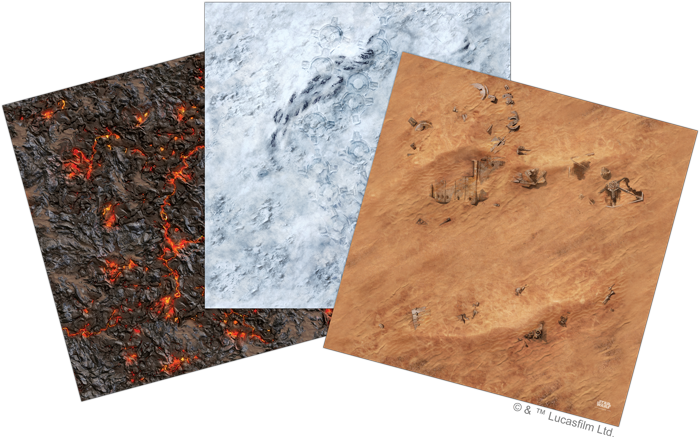 Upgrade your play area with the Sullust Game Mat, the Hoth Game Mat, and the Jakku Game Mat! Each of these playmats offers a 3’ x 3’ slip resistant play area for you to play out your Star Wars: Legion battles right on your tabletop. What’s more, these mats are designed to be easily combined with each other to create a 3’ x 6’ area perfect for standard-sized games. With the Hoth Game Mat, on the other hand, you can return to the frozen snowfields where the Rebel Alliance once sought shelter from the Empire. No matter if you’re recreating the Battle of Hoth or running a new operation on the planet, Hoth is sure to feature some of your most memorable battles. Finally, the Jakku Game Mat transports your troops to the remote desert planet to battle among the windswept dunes. The planet’s wide spaces make for a sweeping and iconic vista, whether your troops are using its scorched badlands to flank your opponent or set up an ambush. The Empire and Rebellion move their troops across the galaxy, waging war on countless planets. Dive deeper into the Star Wars galaxy with the Sullust Game Mat, Hoth Game Mat, and the Jakku Game Mat! Deploy your troops to the far corners of the galaxy with the Sullust Game Mat (SWS48), the Hoth Game Mat (SWS49), and the Jakku Game Mat (SWS50), now available for pre-order at your local retailer or online through our website!